On the last two Saturdays in October, New Hope Valley Railway (NHVR) will offer train rides and family fun in the rail yard during Track or Treat Halloween Express. This year, marks the 20th year of the family-friendly event, which takes place on Oct. 24 and Oct. 31, with Ghost Train excursions departing at 4, 5:15, 6:30 and 7:45 p.m. An additional 2:30 p.m.train departure time is being added on Oct. 31. Tickets are $13 for adults and children (2 and under free) and should be purchased in advance at www.TriangleTrain.com. Visitors are encouraged to arrive at least 30 minutes prior to their train departure time. The first Halloween Train departed Bonsal on Oct. 26, 1996 with 184 riders and was organized by NHVR member Walt Williams and his wife Brenda. Along with others on the all-volunteer railroad staff, they planned and carried out the annual Halloween activities for 11 years. Today, Track or Treat Halloween Express has grown into a two-Saturday event during the end of October. Along the 8-mileround trip train route, riders will see interactive Halloween scenes. The decorated haunted rail yard will include a 20-foot black cat and pumpkins atop the North Carolina Railroad Museum store train car singing Monster Mash, Ghostbusters and Michael Jackson’sThriller. Visitors to a stationary train caboose in the rail yard will meet palm reader Iseemore the Magnificent and Dr. CO2, the creator of magical boo bubbles. Children and adults are encouraged to wear their costumes and each child will receive a small gift before the train ride, while supplies last. The earlier train ride times are recommended for younger riders who may be frightened by the Halloween characters. Bruster’s Real Ice Cream of Apex will serve cups of homemade ice cream in a variety of flavors including pumpkin patch, pumpkin cheesecake, orange sherbet, chocolate cookie dough and Oreo. Attendees can add sprinkles, M&Ms, gummi worms and whipping cream as toppings. Ice cream is not included in the ticket price. “We strive to make our Track or Treat Halloween Expressevent suitable for all ages to enjoy. It’s a fun event for both children and those who are still children at heart,” said Dave Chasco, NHVR marketing director. (Bonsal, NC, September 16, 2014) – New Hope Valley Railway (NHVR) is opening its rail yard for an evening fundraiser with activities that adults can enjoy. Brew ‘n’ Choo http://www.triangletrain.com/brewnchoo/ scheduled for Saturday, Oct. 4, from 4 – 9 p.m., will feature one-hour train excursions departing throughout the evening along with local craft beer, food trucks and live music at the rail yard located in Bonsal, N.C., 30 minutes southwest of downtown Raleigh. The fundraiser will benefit restoration of the historic Cliffside 110, a steam locomotive acquired by the non-profit railway museum last year. The steam engine is being repaired by NHVR volunteers so it can operate on the four-mile main line used by the railway for public ride days. The estimated restoration cost is between $350,000 and $600,000. “As an all-volunteer railroad staffed by train enthusiasts, we’re always looking for ways to share our rail yard with the public,” says NHVR President Mike MacLean. “Brew ‘n’ Choo gives folks an evening to ride our trains, eat some good food, listen to music and sample craft beers all while supporting the restoration of the Cliffside 110 historic steam engine,” he adds. Fortnight Brewing Company www.fortnightbrewing.com will be pouring its most popular beers for tastings and $5 pints. Manna Concessions www.mannaconcessions.com will sell a variety of special menu items including fried pimento cheese sliders, shrimp po’ boy sandwiches, smoked chicken and apple sausage, and barbeque pork sandwiches. Each meal is served with a side and non-alcoholic drink. Specialty cobblers, brownies, cakes and other sweet treats will be sold by LadyBug’s Treats www.ladybugstreats.org. One-hour, round-trip steam train excursions will depart at 5 p.m. and 7:30 p.m. and the diesel train departs at 6:15 p.m. and 8:45 p.m. Admission to the Brew ‘n’ Choo fundraiser costs $14/adult for the steam train excursion and entertainment. Diesel train excursion tickets are $12/adult. Tickets should be purchased online prior to the event at www.TriangleTrain.com. Tickets will also be sold at the rail yard ticket booth the day of the event. Beer and food will be sold separately at the event and are not included in the train excursion fee; however, guests will have the option to select and purchase their meal in advance when buying tickets online. No outside drinks or food will be allowed inside the rail yard during the event. Designated drivers can request a special wristband upon entry at the ticket booth for free soda and water all night. Children may attend the family-friendly event but must be accompanied by an adult at all times. Visit the website (link to http://www.triangletrain.com/brewnchoo/) and the Triangle Train Facebook page (link to www.facebook.com/TriangleTrain) to stay up-to-date with the latest event information. There are also special event ride days and the popular Track or Treat Halloween Express and Holiday Santa Trains. Also available are opportunities to operate a train, host a birthday party in an historic caboose, and visit the North Carolina Railroad Museum, G Scale model garden railroad and gift shop. (Bonsal, NC, Oct. 31, 2013) — The New Hope Valley Railway (NHVR), will offer its annual Holiday Santa Trains the first two weekends of December on Saturdays Dec. 7 and 14 and Sundays Dec. 8 and 15, 2013. Trains will depart from the rail yard located in Bonsal, N.C., just 10 minutes south of Apex off of U.S. Highway 1, Exit 89. 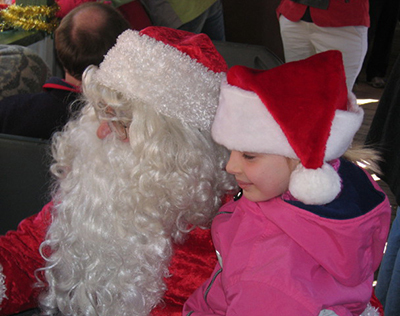 A number of holiday characters will interact with kids of all ages during their visit. Frosty the Snowman will greet children in the rail yard, while an elf from the North Pole hands out candy canes or coal depending on who’s been naughty or nice. Santa Clause will be on board the train joining visitors for a ride in the open-air passenger cars pulled by either a diesel or steam locomotive. Santa will go car-to-car, talk to each child and pose for photos during the hour-long ride. Chasco says there can be a chill in the air in December and advises visitors to check the weather and dress accordingly. “Trains will operate in snow, sleet or rain, so come prepared,” he adds. Hot chocolate, hot dogs and other concessions are available from a food vendor set-up in the rail yard. Tickets may be purchased online at www.TriangleTrain.comor at the train yard the day of the ride. • $10 for adults and $7 for children, ages 2-12. • $12 for adults and $8 for children. NHVR recommends buying tickets online and arriving at the train yard 30 minutes before the listed departure time. Learn more by visiting www.TriangleTrain.com orwww.facebook.com/TriangleTrain. New Hope Valley Railway will host Track or Treat – a Spooky Ride on the Halloween Express on Saturdays, October 19 and 26, at the rail yard in Bonsal, located off of U.S. Highway 1, just 30 minutes southwest of downtown Raleigh. Children and adults of all ages will enjoy riding a real locomotive decorated with cob webs and jack-o-lanterns as they encounter witches, goblins and a mysterious ghost train during the hour-long train ride. Riders receive a sweet treat as they exit the train after the 4 p.m., 5:15 p.m., 6:30 p.m. and 7:45 p.m. rides through the haunted woods. Visitors can also see the G-Scale garden railroad, visit the North Carolina Railroad Museum and get up close to real railroad cars and equipment in the yard. Riders may visit the gift shop to take home their own Triangle Train whistles, engineer hats and other train memorabilia. For tickets and details, visit www.triangletrain.com or facebook.com/TriangleTrain. New Hope Valley Railway opens a few weeks earlier this season so it can be part of the statewide North Carolina Science Festival. The railway, which features seasonal rides on its steam and diesel engines, will open Sunday and feature a day of demonstrations and kids’ activities, along with its regularly scheduled rides. Gates will be open from 10 a.m. to 5 p.m., Sunday at the train yard in Bonsal, N.C., which is 10 minutes south of Apex off U.S. 1. The event will include train science related activities, including how a diesel motor turns a generator to create electricity; how train tracks work; and what’s behind the workings of boilers and nozzles. New Hope Valley Railway – Halloween Express!!! Trains run Saturday Oct. 24 departing at 4:00PM, 5:15PM, 6:30PM, and 7:45PM with each ride taking about an hour. Advance purchase of tickets is required. Also – Fall Steam Spectacular! Come ride behind two steam engines! Enjoy a train ride behind our own Engine #17 and visiting Flagg Coal #75 through the beautiful New Hope Valley from Bonsal, NC. The New Hope Valley Railroad (NHV) was organized in 1904 by W. Roscoe Bonsal, Samuel O. Bauersfeld, and Henry A. London. Bonsal and Bauersfeld were originally from Baltimore, but came south to Hamlet, NC in 1895 as civil engineers to work on the railroads then building across the South. London was from Pittsboro, NC, and among many other achievements in his life, owned or controlled the timber rights in the New Hope River Valley. Bonsal had been very successful in the railroad business, and by 1898, was a vice president of the Seaboard System with an almost exclusive contract to supply ties for the expansion of that railroad. New Hope Valley Railway – Next Ride Day is September 6th! Come experience the thrill of riding the rails – see, hear, and feel a part of railroad history. 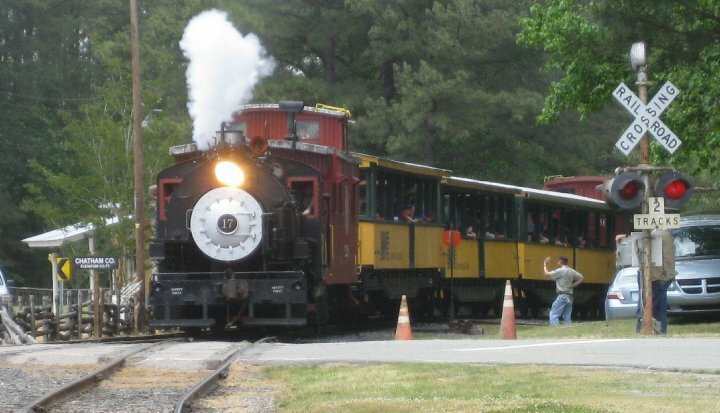 The New Hope Valley Railway at the North Carolina Railroad Museum has operating days in season from May to December, with activities, themes, and events for visitors of all ages to enjoy. Purchase train ride tickets for our scheduled operating days or you can charter group train rides, schedule operate-a-loco, or have a birthday party in a historic caboose. For more information and to read more about the history, visit www.nhvry.org!